Media captionHassan Rouhani: "Iran will not surrender." Mr Trump said on Friday that he would stop signing off on the agreement. The UK, France and Germany responded that the pact was "in our shared national security interest". The EU said it was "not up to any single country to terminate" a "working" deal. 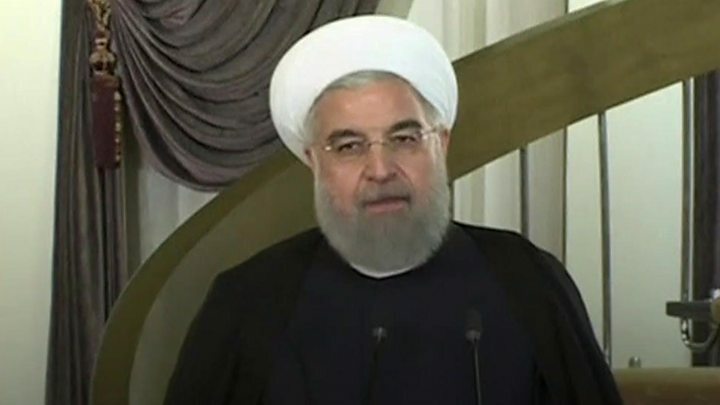 Iran's President Hassan Rouhani said the US was "more isolated than ever". "Can a president annul a multilateral international treaty on his own?" he asked. "Apparently he doesn't know that this agreement is not a bilateral agreement solely between Iran and the United States." The deal, signed in 2015, is between Iran and six international powers - the UK, the US, Russia, France, Germany, and China. It imposed curbs on Iran's nuclear programme in return for an easing of international sanctions. In a combative speech on Friday, Mr Trump called Iran a "fanatical regime" and said it had violated the terms of the deal. He accused Iran of sponsoring terrorism, and proposed new sanctions. 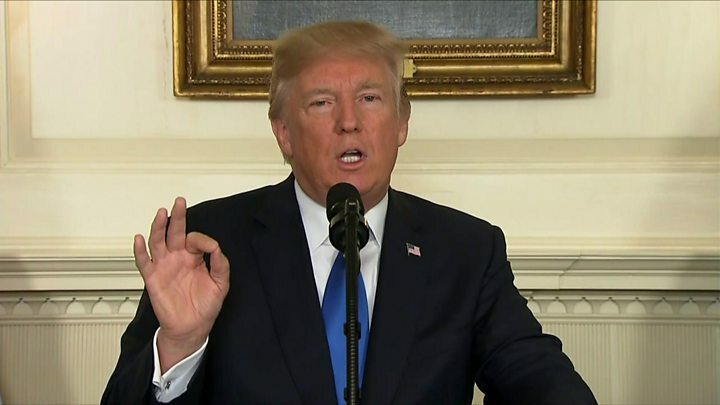 "We will not continue down a path whose predictable conclusion is more violence, more terror, and the very real threat of Iran's nuclear breakout," he said. International observers say Iran has been in full compliance with the agreement. China has not spoken since Mr Trump's speech but previously called on the US to preserve the deal. Russia's foreign ministry said it regretted Mr Trump's decision but did not expect it to stop the deal being implemented. What does Trump's refusal to sign mean? Congress requires the president to certify every 90 days that Iran is upholding its part of the agreement. Mr Trump had already recertified twice, but refused to sign a third time ahead of a Sunday deadline. Congress now has 60 days to decide whether to pull out of the nuclear deal by re-imposing sanctions. Although some advocates of the deal had feared that Mr Trump would withdraw the US entirely, he has instead essentially referred the matter to Congress. What changes does he want? Mr Trump is seeking the end to the nuclear deal's so-called "sunset clauses", one of which allows for the lifting of restrictions on Iran's nuclear enrichment programme after 2025. He announced treasury department sanctions on Iran's elite Revolutionary Guards, which he called the "corrupt personal terror force of Iran's leader", and called for restrictions on Iran's ballistic missile programme, which is not covered by the deal. Last month, Iran said it had successfully tested a new medium-range missile with a 2,000km (1,200-mile) range. The president said that congressional leaders were drafting amendments that would curb Iran's ballistic missile development and eliminate expiry dates on restrictions to the country's nuclear development. How did other key players respond? Yukiya Amano, head of the International Atomic Energy Agency (IAEA), said Iran was implementing the deal and was subject to "the world's most robust nuclear verification regime". 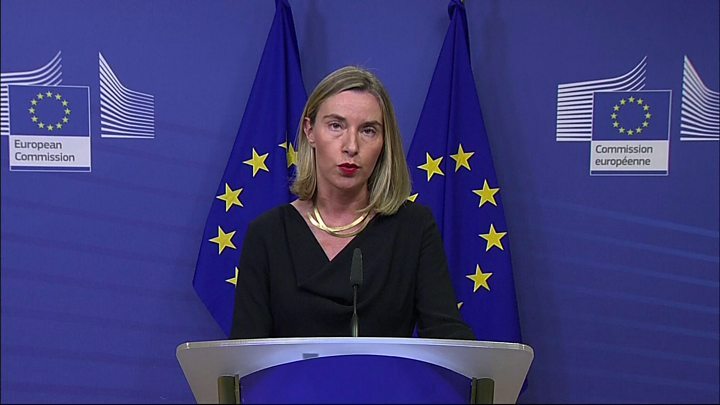 European diplomats warned that any such unilateral changes to the agreement were likely to trigger the deal's collapse and a return to a nuclear standoff in the Middle East. Israeli Prime Minister Benjamin Netanyahu congratulated Mr Trump, who he said had "boldly confronted Iran's terrorist regime". Saudi Arabia also backed the US president's "firm strategy"
President Trump has recast the list of Middle East threats, with Iran replacing so-called Islamic State (IS) as Enemy Number One. That world view is shared by his strongest supporters in the region, including Israel and Gulf Arab leaders who have long seen Iran as their primary threat, and a rival with vast sway across the Middle East. They resented Washington's focus on the Iran deal during President's Obama administration. Like President Trump, they want to undo his legacy. The new approach imposes new sanctions but stops short of designating Iran's elite Revolutionary Guards as a terrorist group - a step Iran says would be tantamount to a declaration of war. The urgent question now is whether the new strategy will embolden Iran's hardliners including the Revolutionary Guards. Like US forces, they're involved in battles to defeat IS in Iraq and Syria, and may also see a new enemy. The loosening of sanctions is dependent on Iran restricting its nuclear programme. It must curb its uranium stockpile, build no more heavy-water reactors for 15 years and allow inspectors into the country.